Make yourself at home. That's the motto of this boutique apartment. A haven of peace, sophistication and comfort, among the hills of the forest and the lagoon. A great choice for those who want to get to know another Rio de Janeiro, in a prime, peaceful, small-town-like location with easy access to shops and prized restaurants. Newly renovated apartment (updated photos). 3 bedrooms (1 with exclusive bathroom) for up to 8 guests with contemporary decor. 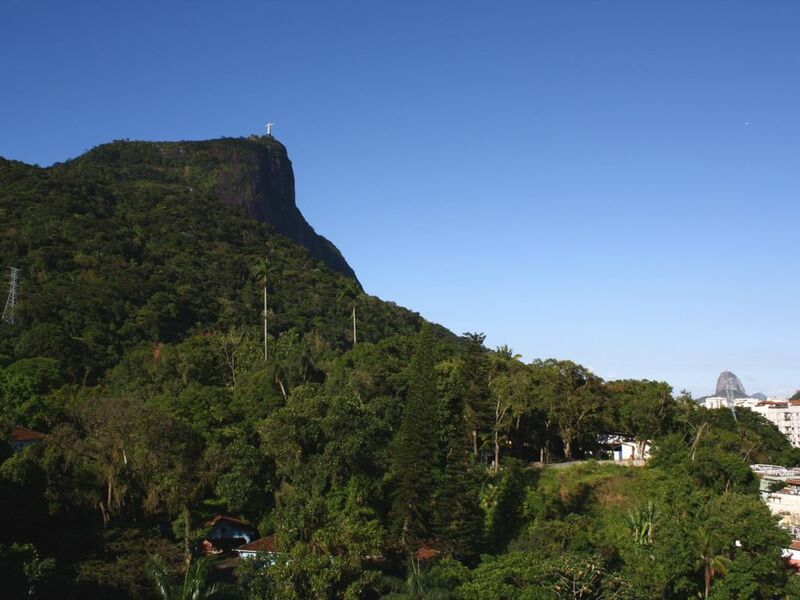 Front view of Christ the Redeemer, Sugar Loaf and Tijuca Forest. One can walk to the lagoon and to the Botanical Garden in a few minutes. Close enough to the Leblon and Ipanema beaches and other tourist attractions. A balance between the hype of the big city and the serendipity of a small town. High floor with great ventilation. 120 square meters with large living room and dining table for 6-10 people (retractable table). Accommodations: 1 suite (king size bed) + 1 bedroom (queen size bed) + 1 bedroom with TV (queen size bed). All rooms with black-out curtains. Prime bed sheets and towels free. Nice lighting with bounced light and dimer in all environments. Large kitchen with cooking utensils, pans, all kitchen appliances, including washing machine. Dishes, glasses and cutlery for 8 people. Cable TV, broadband wi-fi internet (10MB) and printer. 1 Parking space. As the street is safe, many residents with two cars park their cars on the street outside the building. There is a secure paid parking lot just 2 blocks away. Amazing view to the Christ, Sugar Loaf and to the forest. You couldn't even tell you are in such a big city. A type of silence it is hard to find in Rio. No high neighbor building. High standard building. Safe zone to walk at all times, away from street crime and favelas (slums). Antiallergic furniture and beds. Apartment will be perfectly clean when you arrive. This is out commitment with you. Used this lovely flat for our 7 day base during the World Cup days. Neighborhood is picturesque, quiet, and quite safe, yet within easy access of a major thoroughfare which allowed great access to bus lines. Leblon and Ipanema beach very easy to get to from here. World famous Jardim Botanico within walking distance and is highly recommended. Nice selection of restaurants, bars, shops, and two grocery stores within walking distance. Financial services were hard to come by in the immediate area. Apartment building staffed by very friendly and attentive 24 hr security. Landlord always immediately available to address the rare issue. Fully equipped kitchen for self-catering. We were a party of seven and didn't want to leave at the end of our stay. In all, this property is a clear-cut excellent value for a visit to Rio. Alugamos o apartamento para o período do carnaval. Apartamento super confortável e decoração de muito bom gosto. Localização ótima! Fomos atendidos pelo Mathias com muita atenção. Os porteiros do edifício também foram super educados e prestativos conosco. Indico com certeza e em breve entraremos em contato para alugar o apartamento novamente. Un havre de paix dans un magnifique quartier ! Un havre de paix dans l'un des plus beaux quartiers de la ville ! Nous passons régulièrement des vacances dans ce magnifique appartement, aussi calme que confortable, et offrant toute la sécurité voulue. Idéalement situé au cœur d’un des plus beaux et paisibles quartiers de Rio, vous trouverez tous les commerces et magasins désirés, ainsi que d’excellents restaurants et « padarias ». Extrêmement bien desservi, les plages de Leblon et Ipanema, ainsi que la Lagoa, sont à un battement d’aile, dix minutes à peine. L’accueil est irréprochable ! Les propriétaires sont aussi charmants qu’attentionnés. Nous vous souhaitons un excellent séjour, avec nos très vives recommandations. Merci d'être venu, il est toujours un plaisir de vous accueillir! Ótimo Apartamento, muito bem localizado, nos atendeu perfeitamente. Valeu a pena. Foi um prazer recebê-los, Ricardo! Esperamos vê-los novamente! Eu e minha família passamos uma ótima semana nesse belo imóvel, bem localizado e muito bem cuidado. O Mathias foi muito solicito durante toda a estadia. Pode alugar tranquilamente. The greenest neighborhood in Rio. View of the Tijuca Forest, Christ the Redeemer, Sugar Loaf and Lagoa. The 3-minute shopping (walk) and the charming La Bicyclette bakery, where you can have a delicious brunch. On foot you can also visit the Botanical Garden of Rio de Janeiro, the lagoon and its Park skates and Lage Park, home of the famous School of Visual Arts. At lunch or dinner you can choose to walk to Lorenzo Italian restaurant, good pizza Mama Jamma. Or the Yume, one of the best Japanese restaurants in town, or visit the famous Bibi Juice juice bar. On the outskirts of the Garden Bar have the bars, Caroline Coffee, Gibeer, Restaurant Nanjing, the Quadrifoglio prize, and the famous pizzeria Braz. Proibido fumar no imóvel. Não aceitamos animais de estimação. É necessário preencher um contrato de locação.